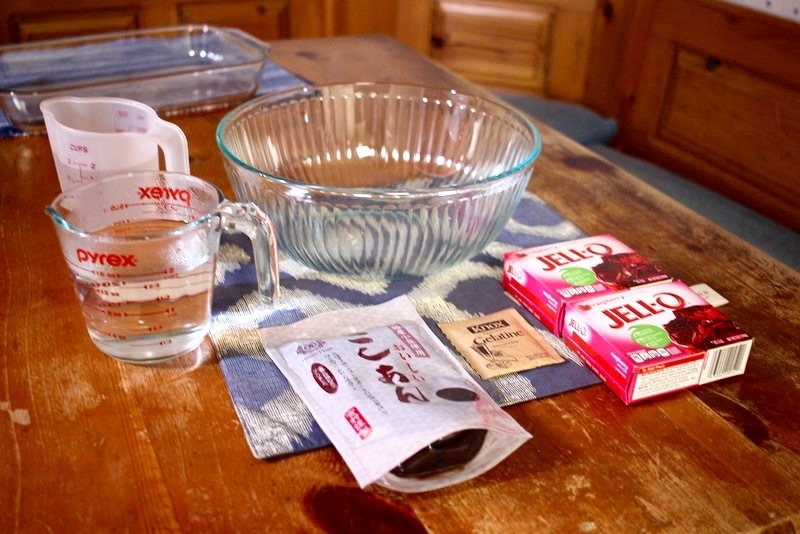 In the Thanksgiving holiday spirit, I like to make this very simple and easy Raspberry Koshi An Jello recipe. I'm usually preoccupied with work up until the holidays, so any dish that is quick and delicious is perfect for the Thanksgiving dinners or Friendsgiving events that I have. It's easy to make with friends or family to spark that “togetherness” feeling that the holidays need! Use it as a side dish or dessert for your Thanksgiving dinner or be fun and use it as a hip Japanese-American substitute for cranberry sauce! When I first had this layered jello, I was at my friend’s house and his mother made it for a side dish. I fell in love with it the minute I had it and even though I was taught to enryo (show restraint), I couldn’t stop eating it. I didn’t care if other people didn’t get any after me, it was just THAT delicious to me. But in addition to being so delicious, it was a dish that resonated with me. It was a dish that said Japanese American. It took something so American, the famous JELL-O dish, and incorporated something just as famous to the Japanese palate: koshi-an (smooth Azuki red beans). I remember going to my friend’s mother and telling her that I MUST have this recipe. When she explained to me that it was a VERY EASY dish - almost one that didn’t require a recipe - I just couldn’t believe her, because I had seen my mother make other layered jello dishes with the time consuming process of alternating layers. I couldn’t believe how easy and magical this jello was, in the sense it also layered itself! 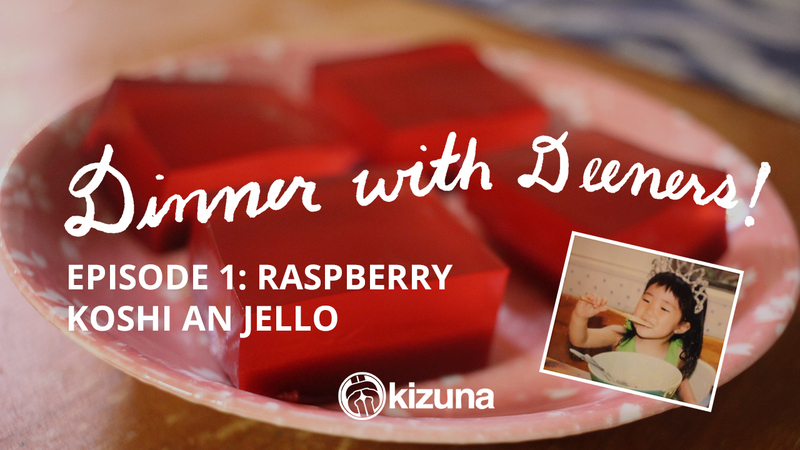 Everything you'll need to make this delicious Raspbery Koshi An Jello! Mix water, JELL-O, and Knox Gelatin together until dissolved. Mix koshi-an into the above mixture until dissolved. Pour into a 13x9 pan. Dina Furumoto is the Administrative Assistant at Kizuna. She got her nickname during the summer of 2016 when staff and counselors started addressing emails to her as “Deen-y”, “Deeners”, and “Diners” and since then the catchy nickname has been adopted internally within the Kizuna family. It has always been Dina’s childhood dream of owning her own restaurant or bakery. Her passion has always been attached to the kitchen and she grew up baking with her mother and cooking Japanese cuisine from her bachan. Dina has also dedicated her time with the Japanese American community and is very excited to be able to host, “Dinner with Deeners”, a cooking channel that has been able to combine both her passion for cooking and to the Japanese American community. Dina Furumoto is currently the Marketing Coordinator at Kizuna. She graduated from Cal Poly Pomona with a B.A. in Sociology with an emphasis in Criminology and a minor in Political Science. Dina has had interned in numerous organizations in the Japanese American community. With her combined internships and experiences, she has been able to participate in various organizations in the Japanese American community. Working with Kizuna has allowed Dina to continue to pursue her passions of giving back and being involved in the community. Dina also shares a deep passion of baking and Kizuna has helped pursue her pastry dreams by allowing her to be a host of their cooking show called Dinner with Deeners.